It was surreal to see so many world’s finest violinists in one room. Whether it is the years of very hard working or something special about the instrument they devote their life to, these famous artists are some of the most real and humble people I’ve met. The Opening Concert was also a great success. It started with the exciting Enescu's Rhapsody for orchestra, performed by the China Youth Symphony Orchestra. Then a number of previous prize winners performed solo pieces, such as Mozart Violin Concerto No. 5 (Xiang Yu) and Bartok's First Rhapsody (Ning Feng). 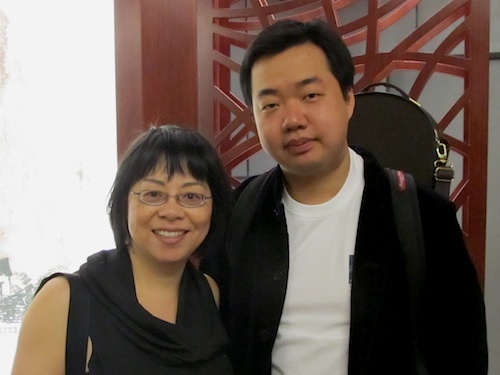 I am a big fan if Ning Feng (a fellow v.comer), and I think his Bartok was exquisite and full of love carried out by his superb technique. I met him during the reception before his performance. What a nice guy! His new biography was published last month in China. I can’t wait to read it. I’m also hoping to get a chance to interview him some day. Speaking of interview, I have just scheduled an interview with Kerson Leong and his family. Kerson played Saint-Saëns - Introduction & Rondo Capriccioso during the opening with passion and technical ease. The audience went wild. An old gentleman sat next to me was in total disbelief and kept saying, “Oh, this is scary!” Yup, you'll see why this is so when you read my interview in near future. Today is the first half of the senior round one. There are a few very fine competitors with Zeyu Li and Andi Zhang on top of my favorite list. The audience is very warm and supportive. They were first told not to clap but the audience couldn’t help themselves, so after a few hours, the panel relaxed the rule. I’m also impressed by a few quite young (look like 5-7 years old) kids in the audience, sitting there for hours quietly and cheerful. You can’t force young kids to love music like this. Now if anyone is to argue with me about the value of violin competitions, I only need to remind them that they should keep their mind open and mouth closed until they’ve participated in one of these international events. Thanks Laurie for added links! I'm off to the second day of the competition. It's the 2nd half of the 1st round for the senior young competitors. If you can't watch the live stream, don't worry, I was told that they'll put in the archive and possibly some will be on youtube in future. Glad to hear that you made it!!! Take care and looking forward for more updates. I'm a fan of Ning Feng too!! Hope you get to interview him! After the first day, Alexi Kenney is clearly in a class of his own. Paul, I'm not big on travel either but sometimes it's worth the trouble. I hope you are able to watch the live stream at home. The semi-final and final should not be missed.